A large 2 bedroom apartment with private garden located in the heart of La Zenia. The apartment also features 2 double bedrooms, spacious lounge, separate dining room, fitted kitchen, terrace & bathroom. The garden is fully enclosed making it perfect for dogs and features an outdoor dining area and barbecue. Guests also have access to the huge communal swimming pool and also there is also a huge communal barbecue area. 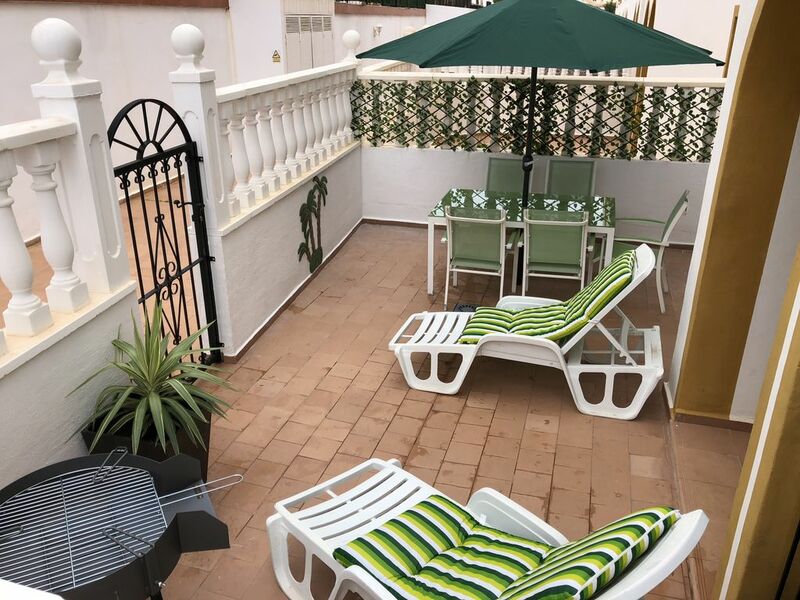 The apartment is located just a 10 minute walk from the beautiful La Zenia beach and also a 10 minute walk from La Zenia Boulevard which is a shoppers haven with all the major retailers like Zara, Primark, H&M, Jack Jones,Mango, Pull & Bear and many many more. The Boilevard also features restaurants for every budget, nightly entertainment, bars, children's activity areas, bowling alley & other leisure activities dependent on the time of year. There are also lots and lots of bars & restaurants located on the doorstep of the property and there is a huge supermarket within a 2 minute walk of the property. Great break away from it all! Lovely welcome from Roz and a lovely apartment, we loved the place and will definitely recommend it. Comfortable and close to shops, bars and restaurants. Meet and greet very friendly. This was a perfect apartment for our family of 4. Everything was spotless clean and the apartment had everything we needed. It has a lovely pool on the complex also. It's a short stroll to pubs and restaurants and to La Zenia Boulevard shopping centre. Would definitely book this property again. The owners were very friendly and helpful too. We love it close to La Zenia Boulevard, locals bars and restaurants. Very clean and there was every think you need.